Product #46640 | SKU 14545 | 0.0 (no ratings yet) Thanks for your rating! For Curved Fingerboards, Parallel Clamping Prevents "String Bend"
The 14545 Guitar Capo from K&M is a plastic capo for nearly all 6- and 12-string guitars with curved fingerboards. 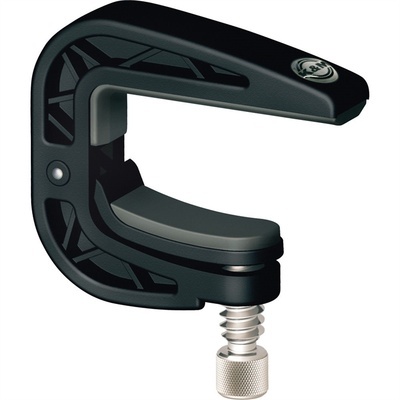 The capo's clamping mechanism is quick to attach to the guitar neck, and just as simple to release. The clamping pressure is adjusted with a screw dial. The parallel clamping mechanism prevents "string bend" when attaching the capo and tuning is not affected.